Not to be confused with Generally recognized as safe and effective. Self-affirmed. The manufacturer of this chemical or substance had performed all necessary research, including the formation of an expert panel to review safety concerns, and is prepared to use these findings to defend its product's GRAS status. FDA Response to GRAS notification. The manufacturer has performed all the aforementioned due diligence, and submitted a GRAS notification to inform the Food & Drug Administration of a determination that the use of a substance is GRAS. Following evaluation the FDA provides three possible responses: 1. FDA does not question the basis for the notifier's GRAS determination, 2. the notification does not provide a sufficient basis for GRAS determination, or 3. the FDA has, at the notifier's request, ceased to evaluate the GRAS notice. 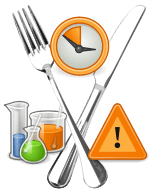 As of June 2015 (beginning in 1998), 572 ingredient or food substances have been filed with the FDA. These petitions, submitted by sponsors or manufacturers, are reviewed for the safety evidence contained in the document. FDA posts status of the review as either without further questions or the petition is withdrawn by the applicant. For substances used in food prior to January 1, 1958, a grandfather clause allows experience based on common use in food to be used in asserting they are safe under the conditions of their intended use. The FDA can also explicitly withdraw the GRAS classification, as it did for trans fat in 2015. The Code of Federal Regulations, Revised as of April 1, 2010, includes (CFR) title 21 170.30(b) that provides general recognition of safety through scientific procedures requires the same quantity and quality of scientific evidence as is required to obtain approval of the substance as a food additive and ordinarily is based upon published studies, which may be corroborated by unpublished studies and other data and information. When a use of a substance does not qualify for the GRAS exemption, that use of the substance is subject to the premarket approval mandated by the Federal Food, Drug, and Cosmetic Act. In such circumstances, the FDA can take enforcement action to stop distribution of the food substance and foods containing it on the grounds that such foods are or contain an unlawful food additive. ↑ "Generally Recognized as Safe (GRAS)". Fda.gov. Retrieved 2013-03-17. ↑ "GRAS history". diet.com. Retrieved 2010-11-27. ↑ "Address to the FFDCA concerning GRAS". heinonline.org. Retrieved 2010-11-27. 1 2 3 4 5 "GRAS Notices, US Food and Drug Administration". FDA. June 2015. Retrieved 3 June 2015. ↑ "CRF revised statutes". accessdata.fda.gov. Retrieved 2010-11-27. ↑ "Federal Register Proposed Rules - 62 FR 18937 April 17, 1997 - Substances Generally Recognized as Safe". cfsan.fda.gov. More information from the Food and Drug Administration (FDA).